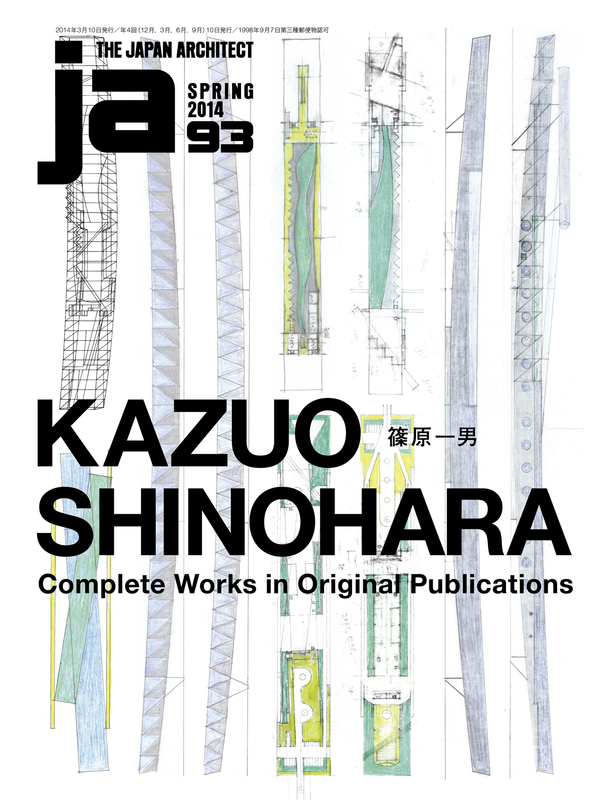 We consecrate “JA93” entirely to the work of Kazuo Shinohara, a name universally familiar as denoting a key player in the realm of heroic controversies and achievements of postwar Japanese architecture.It is also well attested that as an architect Shinohara placed a strong emphasis upon the initial presentation of his oeuvre, namely in “Shinkenchiku” and competing Japanese publications. Naturally, the circumstance that the majority of his early work was for private residences contributed to this priority. His usual practice was to ensure that his architectural beliefs were affirmed through carefully selected photographs, hand-redrawn plans and sections, and meticulously self-composed project descriptions, even while continuing to seek out further methods of expression. As explained in the lead article of this issue, Shinohara’s design philosophy was substantially predicated upon these continual media representations, over which he increasingly exerted a near editorial control.In this issue, original items that were first presented in “Shinkenchiku” and “JA” as the product of in-depth dialogue between Shinohara and the magazine’s chief executive and his staff of editors and Shinkenchiku’s in-house photographers have been reproduced as nearly as possible in their original form. We take the opportunity for an overview of Shinohara’s complete works— from the “House in Kugayama” (1954) through his last and unbuilt project for a small vacation “House in Tateshina.” We believe this issue of “JA” offers an authentic and straightforward approach to the houses and other buildings— to which Shinohara without cease applied an uncommon talent and his own unique way of seeing.Following his death in 2006, Kazuo Shinohara was posthumously awarded the first-ever Golden Lion in Memoriam on the occasion of the 12th Venice Architecture Biennale (2010). Since then, a major series of retrospective exhibitions has taken place in China— with showings now also planned for the United States and Europe. Why does this architect’s presence continue to resonate within our disparate modern age? We invite our readers to reexamine the documentation set forth here and draw their own conclusions from an individual perspective.